Took this recipe off of Pinterest – Mom on Timeout, since I had all of the ingredients at hand and felt like a lazy dinner. I am not a fan of BBQ sauce so I omitted it entirely at first. I also changed the amount of beans as you can see by the red… My slow cooker often seems to cook in less time, so I checked it after 3 hours and it was done as well as I like it. Cook on low for 6 to 8 hours or high for 4 to 5 hours. (I found it was done on low after 3 hours and kept it on warm for 2 more). What to do when your stove gets taken away for repairs? Three choices – BBQ, Microwave or Slow Cooker. Oh, and company for dinner… Pinterest to the rescue as always. The best part is that we had everything in the house! Hope you will try this sometime soon, it beats cooking inside, as we can put our cooker outside, A great way to enhance the BBQ season! Place chicken, potatoes, onion, carrots, celery, and corn into a 6-qt slow cooker. Stir in chicken broth, garlic, thyme, oregano, cayenne pepper and bay leaf; season with salt and pepper, to taste. In a small bowl, whisk together half and half and cornstarch. Stir in half and half mixture and butter during the last 30 minutes of cooking time. Serve immediately, topped with bacon and garnished with chives, if desired. A cold night in the Yucatan calls for a nice warm curry! It was 24 degrees C…LOL. One of my favourite chefs, Stefano Faita of Montreal fame created this tasty dish AND its VEGAN for my friend, Jaromey! Packed with protein and flavour, this vegetarian one pot curry is quick and easy. For a milder flavour, rinse quinoa before using. Add vegetable oil to large saucepan or Dutch oven over medium heat. Add onion, garlic, ginger, curry paste and garam masala. Cook, stirring occasionally, until onions start to soften, about 3 to 5 minutes. Increase heat to medium high. Add 1 1/2 cups vegetable stock, tomatoes, sweet potatoes, chickpeas, and salt and pepper. Bring to a boil. Reduce heat to simmer. Add quinoa. Stir. Cover and simmer for 20 to 25 minutes until sweet potatoes are tender, adding remaining 1/2 cup stock if curry looks too dry. OPTIONAL – Right before serving, stir in spinach. Let spinach wilt slightly. Finish with lime juice and fresh cilantro. Serve. Dont you just love that word, waterzooi ? 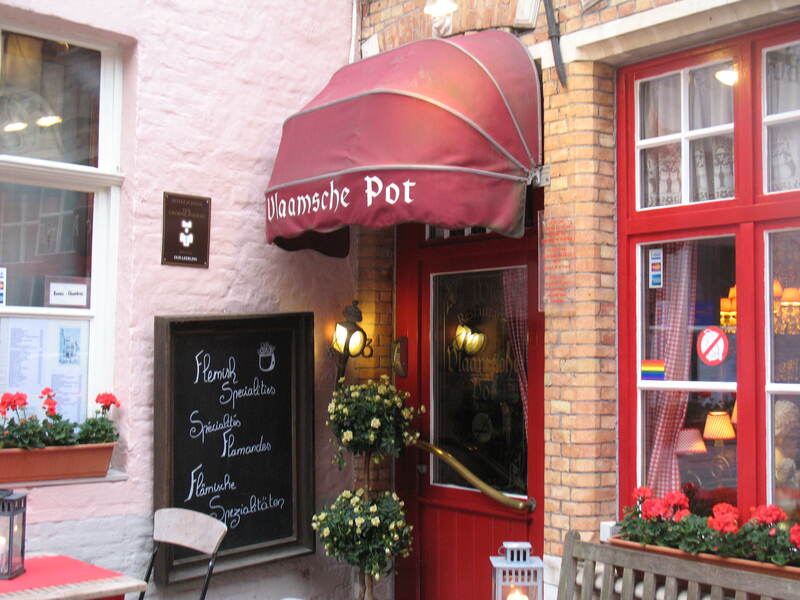 We came across this on our trip to Brugges in 2010 when we ate at De Halve Maan Brewery and again at a very nice little restaurant called Vlaamsche Pot. Its traditionally a fish soup/stew. Since I had some mussels and clams left over from a meal the day before, I sought out a recipe. Behold…Pinterest again. Their recipe called for several types of fish. I like fish but did not want to search out different fish, so I altered their recipe as I usually do to some extent. My version is below. Heat the butter in a frying pan. Add the celery, carrot and onion and cook the vegetables for 3-5 minutes, or until they are soft and glazed. Now add the leeks and cook for a further 2 minutes. Add the stock to the vegetable mixture and allow it to infuse for 3 minutes. Gently poach the fish fillets in the broth for 3-5 minutes. Add the mussels after 1 minute. Remove the seafood from the pan once the mussels have opened and set aside. Strain the stock into a saucepan. Set the vegetables aside to use later. Whisk the egg yolk with the cream in a bowl. Put the stock back on the heat and, once it reaches boiling point, add the cream and egg mixture to thicken the stock and create a sauce. Now mix well with a whisk and make sure the sauce does not come to the boil again. Add the peeled shrimp and half the chives and stir. Place the fish pieces and seafood in a serving bowl along with the vegetables and potatoes. Pour the sauce over it. Garnish with the remaining chives. Serve with a crusty bread and cold beer…preferably Belgian.